Just when you thought the L train couldn't possibly get any worse, construction on the infuriatingly temperamental -- but vital -- link between Williamsburg's hipster paradise and Manhattan will likely ruin your weekend ... oh, and then the next five weekends after that. Basically, if you're in Williamsburg, good luck getting out. 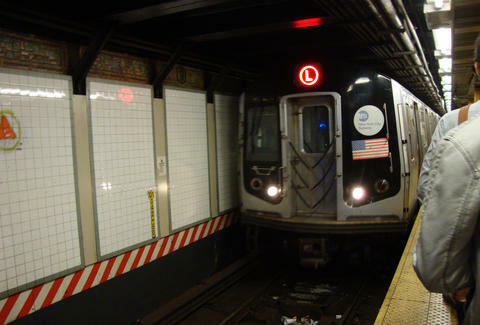 Specifically, starting this weekend, there will be no L trains running between the Lorimer St station in Brooklyn and the 8th Ave station in Manhattan from 11:30pm Friday to 5am on Monday every week until May 18th, according to the MTA. The trains will only operate between the Rockaway Pkwy and Lorimer St stations during the construction, which the MTA said involves critical repairs and maintenance on the line. Way to crap all over the first truly gorgeous spring weekend in NYC! The MTA suggests a few alternatives like banging your head against a turnstile for a while, or taking the A, J, and M trains between Manhattan and Brooklyn, and a combination of buses and trains to get around within the boroughs where the L train would normally operate -- which is all sure to be lots of fun, especially if you're just trying to get home or to brunch or go and chow down on all that food at Smorgasburg. Speaking of Smorgasburg, Gothamist reported that some vendors are planning to offer a shuttle bus service running between Manhattan and the food fest every 90 minutes beginning April 24th. Uber has also stepped up to ease the pain and horror of this transportation nightmare, and announced Friday it is offering $5 carpool service, or "uberPOOL," between Williamsburg and Manhattan for the next five weekends. The ridesharing service said all you have to do is request and uberPOOL car and expect to be joined by someone else who's going the same way, but if you're not matched with anyone, you'll still only have to pay five bucks and there's none of that freaking surge pricing business. Tony Merevick is Cities News Editor at Thrillist and wishes everyone strength and luck as we get through this together. Send news tips to tony@thrillist.com and follow him on Twitter @tonymerevick.